We aim to dispatch the item within 3 working days. 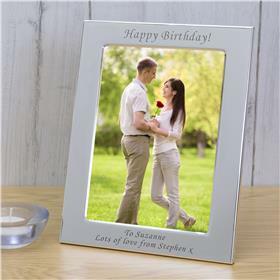 High quality double silver plated frame. Perfect for personalising with a message of your choice. The frame holds two 6x4 photographs (outer dimensions are 173mm x 122mm x 2). 1. Leave a 'note to seller' during the check out process - please remember to press save to save the message. 2. You can message us via eBay messaging service immediately after placing your order. NOTE: Please ensure all the required information is provided. Please double check your details before sending. The details will appear as shown on the images.